​Our top choices are based on buyer experiences and verified test results. turbulence and result in decreased water visibility? You need to have the right kids snorkel gear to make the best of your snorkeling trips. We researched top reviewed snorkel gear for children in the market, and made this handy list of the 5 best snorkel set for kids. Weighing only 14.4 ounces (408 grams), the Speedo Junior Recreation Mask Snorkel Set is designed to be used by most children with ages ranging anywhere from 6 to 14 years old. It is specifically designed for children that have a small and narrow facial contour. Its mask is composed of a lens that is made out of polycarbonate material that is embedded with an anti-fog coat that ensures a clear view all the times. The mask skirt is made from high-grade silicon which provides a good fit and seals to your face thereby preventing from any water to enter. The snorkel has an eighteen-inch long tube made from plastic with a splash resistant mechanism on the top which significantly prevents water from entering, especially if the water is a bit choppy. In general, the Speedo child snorkel set is relatively durable that it can last for years to come. Some children who wear them were able to use the equipment even if they are already teenagers. Well, do not worry if your facial size has significantly increased as you can still wear the Speedo mask by some minor strap adjustment. You are still guaranteed with an excellent facial seal, a beautiful unobstructed view of the water and the surrounding reefs. The Seavenger set is considered a complete snorkeling set where you can take it to your favorite diving spots anytime, anywhere and all in one piece. This particular snorkeling set is composed of a mask, snorkel, a pair of fins and a gear bag. Instead of having the traditional double lens, the mask included in this set has a single lens that provides you with a panoramic frontal view. It means that it has a wide angle feature that allows you to see a bigger part of the reef in just a single glance and without the need to yawn your head from left to right and vice versa. The snorkel has the standard 18-inch long tube with a splash guard mechanism on the top that maximizes the prevention of water entry. Although relatively short and thinner in size, the pair of fins in this set is perfectly designed for smooth and easy swimming with minimal lower leg exertion. It also comes with its own gear mesh bag where you can store this particular set which makes it ideal for traveling. 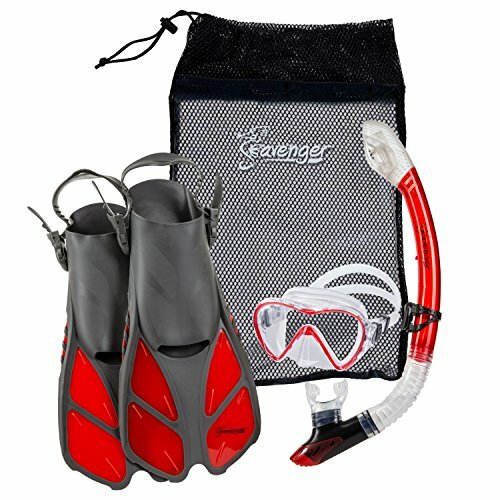 Seavenger adult and youth snorkel set can be used by both adult and children as the product name implies. The simple adjustment of the mask strap and fin strap allows this particular gear to be used by all ages who are into the recreational sport of snorkeling. 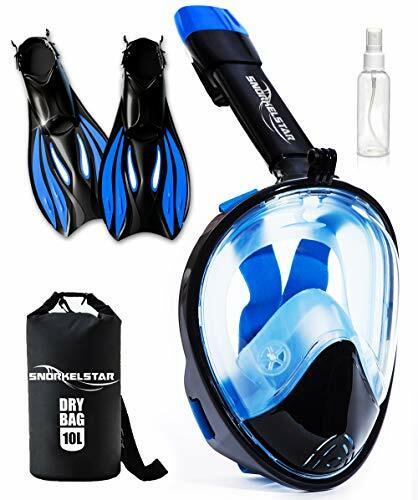 The Snorkelstar set is considered as one of the new-age snorkeling sets available in the market. Instead of having a mask and snorkel being an individual piece of equipment, this particular set offers a mask which is an integrated piece of equipment that combines the mask and snorkel all in one piece. In turn, this provides you with a 180-degree frontal view courtesy from its polycarbonate lens that is round in shape giving you a highly panoramic view of the reef. The snorkel is integrated within the mask and is located at the top center. Since the mask and snorkel are integrated into one piece, this means that there is no need for the use of a mouthpiece and that breathing can be done either from the mouth, nose or both. SnorkelStar is compatible for use with action cameras courtesy from its built-in mounting port located just beside the lower base of the snorkel. The child set comes with its anti-fog spray where a single spatter guarantee you a fog-free snorkeling adventure. 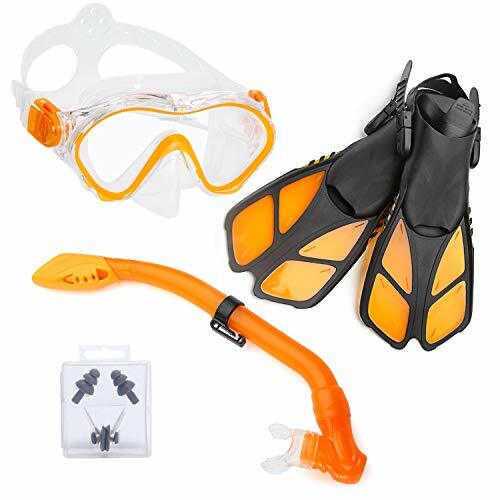 Snorkelstar set also comes with its fins pair which are made of lightweight plastic, a thin blade, holes at the center for smooth gliding and an open heel with adjustable straps that can fit most children’s foot size. Also, lastly, for ease of storage and traveling, this set comes with a 10-liter dry bag where you can store your equipment perfectly dry and safe. The Wacool youth snorkeling set is designed for children ages from 6 to 12 years old. The mask has a ribbed design that gives a watertight seal, a face skirt that is made up of high-grade silicon that can fit most facial contours and an easy to adjust head strap courtesy from its pinch and pull buckle. However, what stands out with the mask of Wacool is the quality of its lens that is made out of tempered glass that is covered with an anti-fog coat. This means that on top of staying just on the surface, your kids can go freediving where the lens can withstand the increasing water pressure and without having a fogged lens. The snorkel of this particular youth snorkel set is classified as a full dry-snorkel that features a splash guard on the top and a purge valve on the bottom. This means that when water enters the tube, it can quickly be cleared with just a single blow of air. The mouthpiece is made out of professional grade silicone that gives your kids maximum comfort while biting giving a long-lasting performance. It has its own carry-on bag where you can easily store your children's set making it perfect for the frequent traveler. 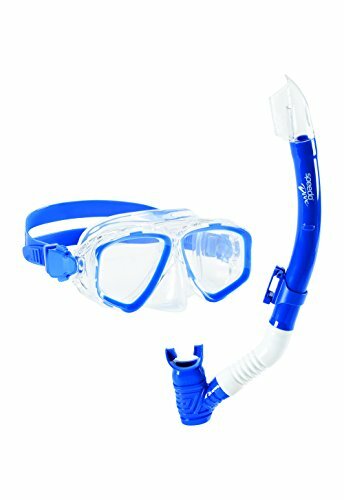 The Elementex Naga Kids Snorkel Set is one of the best snorkeling gear for kids. This set includes a mask, snorkel, fins and a mesh bag. The mask glass has a tempered glass and anti-fog coat which guarantees you that the lens can withstand the increasing pressure if your kid chooses to go freediving while having a fog-free lens. The mask is enclosed in a silicone skirt that guarantees your kid with a good facial seal that is pretty effective in preventing water from coming in. The snorkel has a one-way purge valve at the bottom and a splash guard on the top making your snorkel dry at all times, except when you choose to go underwater. While it has a rigid tube, the mouthpiece is relatively smooth and has a comfortable feel ensuring that your kid will have no hassle in using the gear, even if they are still a newbie. Its fins, while being categorized as a powerfin, still has this smooth and comfortable feel where the legs your kids can easily make a swim stroke when they use the Elementrex Naga snorkel set for kids. U.S. Divers Dorado set is a great starter and will last as long as your kids fit it. Open heeled fins, tempered glass lens and purge valve with splash guard for your snorkel. Our #1 pick and come in two colors for the girls to! Cressi Junior Rocks mask and fins set is for your child who loves the water and gets use out of his equipment. Available in 5 colors with adjustable fins and mask. Snorkel has purge valve and plash guard. Tempered glass lens and a carrying case to fit everything in. Promate all in one set. 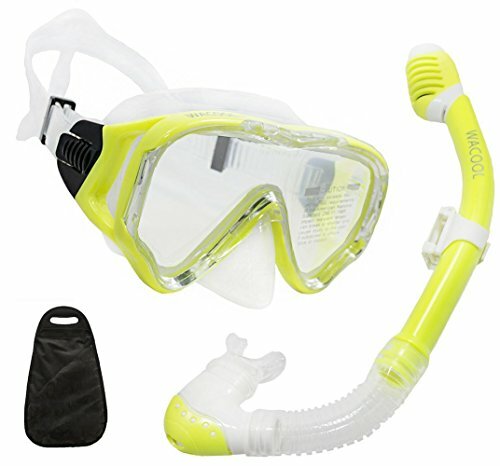 Open heeled fins, tempered glass mask, adjustable snorkel vest and a great snorkel. FFJH kids 1 piece shorty with back zipper is great for kids 3-10 years old for sun protection. If you are tired of putting on sunscreen for your children. Worry no more this will protects against 97% of UV and will provide a bit of buoyancy! Jaws quick spit anti-fog is great to make sure that your mask does NOT fog up. Good for any mask any time of day! We value family. In fact, we provide them with the best in anything they need. We often reserve the weekends and the holidays just for them to spend quality time. That’s the reason why we bring our kids in our snorkeling adventures. As parents, we teach them how to swim and use the snorkeling equipment. Initially, we allow our kids to use our own equipment. However, as you go along with the process of teaching them, you will realize that your own snorkeling equipment has hindered their learning. If we try to compare this to other sports, try to imagine your kid running on a large-sized shoes while practicing basketball. This is primarily due to the fact that kids require their own set of gear, especially when it comes to size and fit which will significantly contribute to the “safety factor” when they are in the water, a toddler snorkel set will make a huge difference from the "size fit" perspective. Snorkels for kids are not just generally small in size, but they are designed to be used by their age bracket. Compared to the high volume mask of adults, children’s snorkeling mask are often classified as low volume. This feature is essential for children where they only need a little effort in clearing a flooded mask. As for the snorkel, it has the same features with adults', but snorkels for kids have a smaller mouthpiece that will give just the right fit for their mouth while providing a gentle surface for their teeth when biting. When it comes to fins, while the adult versions are long and may have a sturdy blade, fins for children have shorter and thinner blades making it easy for them to propel. if you found this article useful, please also take a look at our reef safe sunscreens page, where you can find a list of eco friendly sunscreens for children here.